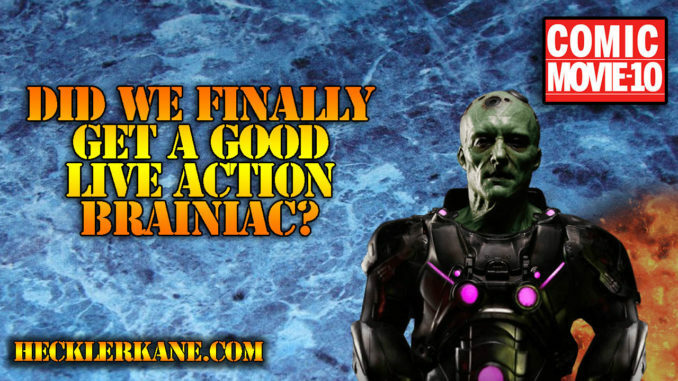 On this episode of Comic Movie-10, the Kane brothers discuss the recent live action versions of Brainiac. For those of you who are unfamiliar with the character, he is one of the most well known villains in Superman throughout the original comics. He first appeared in Action Comics #242 in July of 1958, and his first appearance on television was in the cartoon New Adventures of Superman in 1966. While he is Superman’s main adversary, there are different variations of where Brainiac has come from; some stories indicate that he is from a new planet and he is the collector of worlds, while others explain he was created by Krypton to destroy Superman. It was not until 1996 that Joe and Dan recall seeing Brainiac on television when he was featured on Superman The Animated Series, looking similar to Mr. Freeze. Although there have been a few live action versions of Brainiac, it is apparent that until 2018 there were not any great portrayals that were true to the comics. The first instance of a live action Brainiac was on Smallville, played by James Marsters. He was able to morph into things and his fingers could touch people’s brains. While these factors came from the comics, he did not look at all like what fans would have expected Brainiac to look like. He made his next live action appearance on Supergirl, however he is a friend from the future who comes back in time to warn them of dangers they are going to be faced with. This relates to Brainiac 5, who is the leader of The Legion of Superheroes and acts as a friend to Superman. Supergirl did have another visitor, named Brainiac 8, which followed the characteristics of the original Brainiac as a villain, however 8 was a female, and blue, rather than the classic green color. It was not until 2018 that the world saw a live action Brainiac that was true to his comic roots. The television show Krypton featured the actor Blake Ritson to accomplish this task. Ritson’s character spent the beginning of the season sending his brain waves to a human, which indicated to viewers that he was on his way. This is known as the Voice of Rao. When he did finally appear, he was green and had the exact look of the Brainiac that is so well known from the comics. This version of Brainiac supposedly originated from a foreign planet and he is a collector of worlds. Both Joe and Dan have positive feelings about this portrayal, and say they would love to see Brainiac’s character in a cinematic picture. Had you previously heard of Brainiac? What are your opinions on the various versions of this character? Leave your comments, questions, and opinions, and as always, tune in to the next episode of Comic Movie-10!